Alfred was born in Hermitage in 1887, the only son, and eldest child of James Minchin and his wife Sarah Ann née Turton. His father was a carter working on farms around the area who died in 1899 aged only 32. By the age of 15 Alfred was following his late father’s trade as a carter, he and his mother both doing farm work in East Ilsley. In 1902 Sarah remarried, to James Quelch, a shepherd, originally from Hermitage but working in East Ilsley. In 1904 Alfred decided to ‘do his bit’ and, on 5 January joined the local militia, the 3rd Battalion of the Royal Berkshire Regiment. He evidently enjoyed his militia training, enough to decide to leave the farm and sign up as a full-time soldier. On 18 July 1904 he became a regular soldier with the Royal Berkshire Regiment, being posted to their 2nd Battalion. The 2nd Battalion was stationed in Egypt at the time, moving to India in 1906. After a period of service, usually 7 years, Alfred would have had the opportunity to return to civilian life and serve out the remainder of the standard 12 year service commitment in the reserves. Thus the 1911 census finds him in India with the regiment, later that year he would have returned to England and life in civvy street. Although he was no longer in uniform when war was declared on 4 August 1914 he would have been mobilised immediately and ordered to report to the Brock Barracks in Reading along with his fellow reservists. There the men drew their equipment and went on immediately to Aldershot, where the 1st Battalion of the Regiment were preparing to leave for France. On 13 August they crossed the Channel to Rouen, where they were given a great reception by the locals - they were the first British battalion to march through the town; many more were to follow. From the early months of the war until conscription was introduced in 1916 the local paper published regular lists of the men from each local town or village who were serving in the armed forces. Alfred appears in these lists, under both East Ilsley and Newbury. His Newbury address is given as Oxford Street; he does not appear in any street directories of the period so he was probably lodging with another family. The inference is that he had found employment in Newbury and moved into the town. The 1st Battalion was part of the 6th Brigade, 2nd Division of the British Expeditionary Force (BEF) under Sir John French – the ‘Old Contemptibles’. Reading British histories it can seem that this valiant force was solely instrumental in halting the German advance into France and pushing them back into Belgium – and they certainly played a part, but only a small part; the bulk of the effort was expended by the much, much larger French Army, who took colossal casualties in the first months of the war. On 20 October the 6th Brigade was moved up to Ypres (Ieper) where heavy fighting was taking place in what is known as the 1st Battle of Ypres. A shortage of troops meant that the men of the BEF were repeatedly embroiled in action or subject to heavy bombardment; there was little respite from the front line trenches, which began to take a more permanent look as the trench warfare that typifies the Great War took shape around the exhausted troops. 15 November 1914. It was a really miserable day, cold, raining and incessant shellfire. At 21:00 they [the 1st Royal Berks] were relieved by the 169th Regiment of the French 9th Division and marched off to Divisional Reserve at Hooge. Before they were relieved Acting Corporal H Day left his trench under fire to get water for an injured comrade. Although wounded himself he brought back the water. He was later awarded the DCM. He then goes on to list the names of ten men known to have died that day – seventh on his list is Alfred J Minchin. Alfred was a victim of the ‘incessant shellfire’. On the 15th of November at Zonnebeke, Corporal A.J. Minchin, 1st Royal Berks. Sadly missed. But not from memory or love. As with many victims of shellfire his body has never been identified, so his name is commemorated on panel 45 of the Menin Gate memorial to the missing at Ieper (Ypres), Belgium. Every evening at 8.00pm a bugler sounds the Last Post under the arch of this immense memorial (over 54,000 names). This short evening ceremony has become immensely popular in recent years with crowds of visitors to the area paying their respects to those who fell in the fighting around Ieper throughout the war. 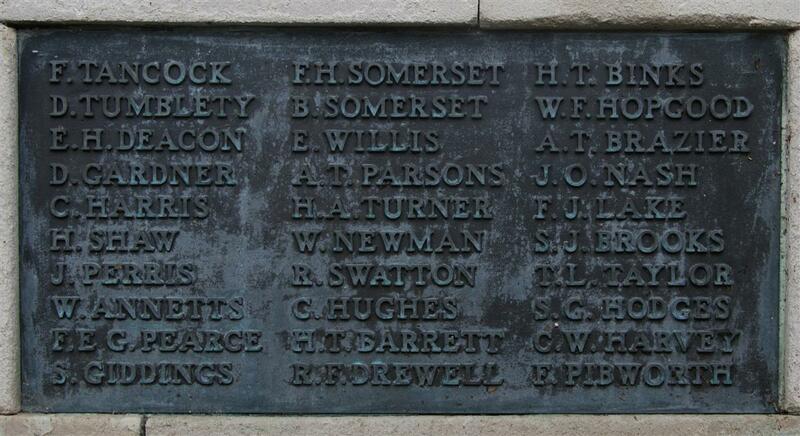 Locally he is remembered on Tablet 10 of the Newbury Town War Memorial and on the village war memorial in the church at East Ilsley, where his mother was still living. Members of East Ilsley Local History Society have researched the men named on their war memorial and Alfred's story appears in their publication Names Familiar To All: The Stories of the East Ilsley War Memorial (available from Sigma Books) and on their website.